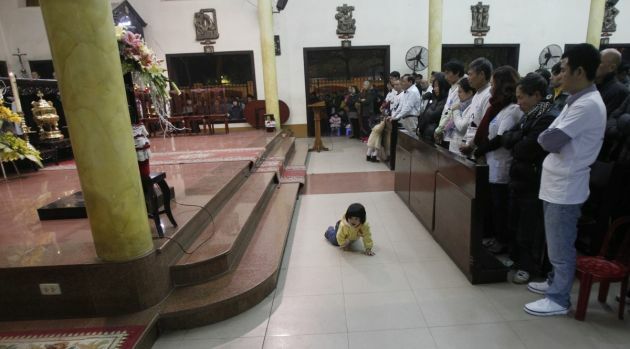 (Photo: REUTERS / Kham)Catholics attend a mass prayer for lawyer Le Quoc Quan as his daughter Assisi Clara Le Viet Ha (L) climbs on ground at Thai Ha church in Hanoi February 16, 2014. Participants in the mass prayer also called for justice for Quan, a political dissident and democracy activist, ahead of his appeal trial which will be happened on February 18, his brother Le Quoc Quyet said. The Hanoi's People Court sentenced Quan, a political dissident and pro-democracy activist, to 30 months in jail for tax evasion after a half-day trial on October 2, 2013. Relations between the Holy See and Vietnam seem to be improving as representatives from both parties are set to meet this week to work on a previously frosty situation. The Joint Vatican-Vietnam Working Group, set to meet on September 10 and 11, will discuss diplomatic relations in the south-east Asian country Asianews.it reported on Monday. Two high-ranking officials from the Vatican and Vietnam have high hopes about the outcome of the two-day meeting in Hanoi. Vietnam's foreign ministry deputy spokeswoman Pham Thu Hang and Father Federico Lombardi, Vatican Press Office director, said the meeting seeks to continue improving "bilateral relations." Among the potential issues that delegations from both States might discuss is the possibility of the Vatican maintaining full diplomatic relations with Hanoi. Tensions erupted in 1975 after Saigon's "liberation," resulting to the scrapping of the abolition of the Holy See's diplomatic post there. The situation of Vietnamese Catholics also worsened since then. After over three decades, the relationship between Hanoi and the Holy See began to thaw. In 2011, the Vatican appointed Father Leopoldo Girelli as a nonresident pontifical representative in Vietnam. Despite the papal representative's appointment, religious freedom continues to be an issue for Catholics, as they represent about eight percent of Vietnam's total population of 93 million. In March, Pope Francis raised the concern when he met with Vietnam's National Assembly Speaker Nguyen Sinh Hung. During the Asian Youth Day in Seoul last month, the Pope reiterated the Church's role in countries, asking leaders not to fear the Holy See. He pointed out that "Christians don't come as conquerors, they don't come to take away our identity: they bring us their own, but they want to walk with us." The Vietnamese delegation is led by Bui Thanh Sơn, deputy minister of Foreign Affairs, while the Vatican panel is headed by Father Anthony Camilleri, undersecretary for Relations with States.